Some music albums are released on several CDs. For example, some bands release 'karaoke' CDs along with their album CDs. There are also various compilations, bonus CDs, etc. A similar, but somewhat different, situation would be having two or more versions (editions) of the same album. You may wonder how to add such albums into Musicnizer. If you add albums from files and folders, Musicnizer recognizes CDs of the same album pretty much automatically. 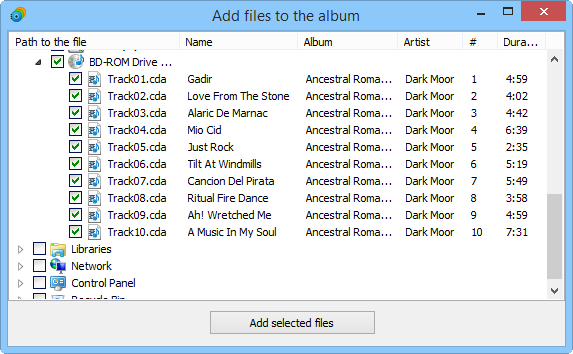 When adding from files, Musicnizer reads information from tags of the files. Among other things, the information may include: artist, album, title, track number, disc number. These details can be used to organize the tracks. However, the program expects files from different CDs to be saved in different subfolders. In our example, there are two subfolders in the album's folder: CD 1 and CD 2. If we put all files into a single folder, Musicnizer will ignore the disc number information from their tags, identifying them as a single CD. In the right-hand area of the "General" tab, there are three tabs: Discs, Parameters, Comment. On the "Discs" tab, we can see that 2 discs were added. If you add an album from physical CDs, select the "From Audio CD" option and add the first disc of your album. Then, in the "Edit info" window, click the green plus on the "Discs" tab (between the list of discs and the album cover). This adds an empty disc to the list. Click this new entry to select the empty edition, then click the "..." button next to the "Album path" field below the list. Click the "Add selected files" button to close the window and add information about the 2nd CD to the album. Click the green plus on the "Discs" tab of the "Edit info" window for the album. Click on the new entry in the list of dics to select the empty disc. Click the "..." button next to the "Album path" field to open the file scanner window. After selecting files, click the "Add selected files" button. This will close the window, saving information about tracks to your Musicnizer database. The same method can be applied to save information about different editions of the same album. You can use the "Disc type", "Title" and "Year" fields to provide further information. The list of the available disc types is just an example, you can remove the existing entries and add your own ones. To do so, click the "..." next to the "Disc type" field and make your adjustments. For example, we could add an entry for remastered albums. Information about tracks can also be entered manually, using the controls next to the track list in the "Edit info" window. While multiple CDs can also be added as individual albums, the described feature allows to manage multiple CDs of the same album more easily.